Tamil TV Channels From DISH – $19.99/mo. DISH offers your favorite Tamil channels in the USA with the Mosaic Pack, Mega Pack and more! Enjoy Tamil TV channels like Adithya, Jaya TV, Sirippoli and Willow Cricket HD with DISH TV Tamil packs. When you choose DISH, you’ll experience the best dramas, sports, news and comedies on crystal clear channels with no buffering. Add Tamil channels to your DISH package starting at just $19.99 per month! For the best selection of Tamil TV channels, choose the Tamil Mosaic Pack from DISH. Watch comedies, news, serials and more, all broadcast from India. Tamil TV is paired with movies from JMovies and music on Sun Music for an entertaining DISH TV package that delivers the best Tamil channels in the USA. Balance entertainment and budget with DISH’s Tamily Mega Pack. You’ll still enjoy a collection of Tamil TV channels from Jaya and more. Watch dozens of programs for just $19.99 per month with the Mega Pack! This DISH TV Tamil pack includes news, movies, serials, comedy and other family favorites at a price that fits your budget. Want to watch Sun TV in the USA? Add this DISH TV Tamil pack to your TV plan when you subscribe to another qualifying international package! Sun Television offers comedies and serials broadcast around the world from Chennai. Your whole family will love watching their favorites from home, including Sugamana Ragangal and Bhakthi Padalgal. Personalize your Tamil TV package with extra channels from around the world, including Willow Cricket HD, NDTV 24*7, France 24 and more. Enjoy more news, sports and global entertainment at a budget-friendly price with these add-on packs, designed with international families in mind. 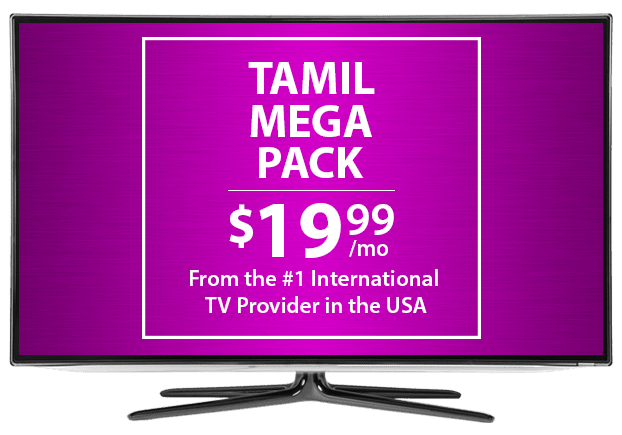 Start watching international TV today for as little as $34.99 per month with the International Basic Package paired with the Tamil Mega Pack. For even more entertainment value, add your DISH TV Tamil pack to an America’s Top plan and qualify for DISH Deals like a free Hopper HD DVR upgrade and free HD for life.